﻿Background: Health economics and outcomes research (HEOR) is a growing field that provides important information for making healthcare coverage and access decisions. However, there is no standard process for incorporating HEOR into the decision-making process, and the current use of HEOR by healthcare payers remains unknown. Objective: To examine how HEOR data are being used by healthcare payers, including managed care organizations today, and how the use of such data is expected to change in the future in relation to access and reimbursement decision-making. Methods: The Managed Care Survey (MCS) and the Pharmacy & Therapeutics (P&T) Commit­tee Survey (PTS) were distributed to decision makers in the United States. A total of 72 managed care decision makers responded to the MCS and 30 P&T Committee members responded to the PTS from US healthcare organizations that cover from tens of thousands to millions of lives. The goal of these surveys was to understand the current use of HEOR data, perceived barriers and limitations in the use of HEOR, and the expectations for future use, and how these and other factors affect formulary decisions. An international perspective was gained by modifying the MCS based on feedback received at a European conference, and a pilot version was given to individuals in emerging markets across Asia, Latin America, and the Middle East and Africa. Results: The majority of US respondents to the MCS (74%; N = 53) and to the PTS (77%; N = 23) indicate that HEOR is currently being used in their decision-making process; but the majority of respondents to the MCS (66%; N = 48) also state that quality assessment is limited (quality assessment was not addressed in the PTS). In addition, the majority of respondents to the MCS (82%; N = 59) expect the use of HEOR to increase in the future. Safety and efficacy were reported in the PTS to be the most important factors in the P&T Committee decision-making process, followed by head-to-head comparisons, and cost. The current use of HEOR in Asia, Latin America, and the Middle East and Africa varied widely across respondents. Conclusion: This study provides an important benchmark of HEOR use in the United States before the implementation of healthcare reform. Between the years 2010 and 2011, HEOR data were used to varying extents across global regions, but their use in the future is likely to increase in relation to access and reimbursement decisions. With increasing access and utilization of healthcare, resources become more restricted, and prioritization in healthcare becomes unavoidable. Health economics and outcomes research (HEOR) is a discipline that is used to complement traditional clinical development information (ie, efficacy, safety, quality) to guide decision makers regarding patient access to specific drugs and services. HEOR has advanced considerably in methodology and in quantity over the past several decades. HEOR can provide data to help healthcare payers determine if treatments work in the populations they serve, and how much of the drug or treatment cost should be reimbursed by the healthcare system. As a key part of the request for comparative effectiveness evidence, the increased use of HEOR data can be expected in future decision-making processes.1,2 In addition, a greater emphasis has recently been placed on positioning the patient at the center of healthcare decisions. Outcomes research plays an increasingly important role in this, because it can provide data on specific populations and treatment combinations that are used. Understanding how these data are used in decision-making in the United States and globally can direct future efforts in this area. 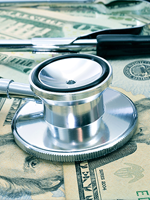 Therefore, it remains unclear how healthcare payers in the United States currently use HEOR, and whether the use of such evidence will change in the future. The objective of this article is to describe the current and expected future use of HEOR data by healthcare payers, and to examine how pharmaceutical drug and manufacturer attributes are used in the decision-making process. This article summarizes the results of 2 surveys administered to individuals in formulary and reimbursement decision-making positions in the United States, as well as an adaptation of one of these surveys and workshops performed in other parts of the world. In 2010, US payers and formulary decision makers were asked to complete the Managed Care Survey (MCS) to understand the degree of the current use of HEOR data, the barriers and limitations perceived, and the expectations toward the future use of these data. The MCS was an internet-based survey developed by the investigators and distributed personally or via the AMCP membership to pharmacy decision makers in pharmacy benefit management (PBM) organizations, health plans, managed care organizations, and Medicaid/Medicare in the United States in April 2010 through the AMCP membership. Around the same time, a second survey, the Pharmacy & Therapeutics (P&T) Committee Survey (PTS), was developed by the investigators sent to P&T Committees in the United States with the objective of exploring managed care pharmacists’ perceptions of factors affecting formulary decisions. The PTS was also an internet-based survey developed by the investigators and was distributed to 176 managed care pharmacists in January 2010. Partial results of the MCS were presented in a workshop at the 12th Biennial European Meeting of the Society for Medical Decision Making (SMDM), with the objective of discussing an extension of such a survey in the European environment.8 Findings from this workshop were subsequently used to adapt the MCS to emerging markets. The revised global MCS was then used at healthcare decision maker workshops in Latin America, Asia, and the Middle East and Africa. The objective of the MCS was to understand how HEOR data are used in decision-making today, and how their use may change in the future. There were 9 demographic questions and 24 additional questions around the use of HEOR and decision priorities. Individuals were asked if they currently use HEOR in their organizations “always,” “often,” “sometimes,” “rarely,” or “never,” and if they expected to increase the use of HEOR in the future (ie, “definitely,” “probably,” “to a limited degree,” or did not). They were asked a single yes or no question as to whether measures were in place to ensure quality of the HEOR data. If an organization used quality measures, it was asked what standards were used. To determine the barriers to the use of HEOR data, the organizations were asked what would be required to increase the use of HEOR data in decision-making. Participants were also asked about their current and expected future use of outcomes-based contracting. To determine what drives the use of outcomes-based contracting, they were asked what the highest perceived value of such contracting was. Finally, the participants were asked to rank the current priorities for decision-making and the expected future priorities. The objectives of the PTS were to evaluate P&T pharmacists’ perceptions of the importance and the performance of 13 drug and manufacturer attributes used in the formulary decision-making process and to compare these perceptions to actual formulary decisions. P&T pharmacists were asked a single yes or no question to determine if they currently use HEOR data in formulary decision-making. Pharmacists were also asked a single yes or no question to determine if formulary decisions were based on the lowest net ingredient cost if data indicated equivalent safety and efficacy. To determine the importance of the product and manufacturer attributes, participants were asked to rate the importance of specific attributes in their decision-making and in formulary placements. To determine the organization’s performance in using these attributes, the individuals were asked to rate how well the organization has performed in using the attri­butes when making formulary decisions. The drug attributes that were assessed included current drug market share, efficacy, head-to-head comparative data, net ingredient cost, outcomes data, drug differentiation, drug superiority, and safety. The manufacturer attributes that were assessed included the ability of the manufacturer to drive market share, customer programs, manufacturer relationship, rebates, and the size of the manufacturer. Finally, to examine drug placement when data appear to demonstrate equal safety and efficacy, pharmacists were asked to choose between hypothetical lipid-lowering and proton-pump inhibitor (PPI) drugs to place on a formulary (Table 1). The drug placement choices were then compared with actual formulary decisions for similar drugs in organizations with published formularies. The survey responses are reported using frequencies and percentages. Table 2 outlines MCS respondent characteristics in the United States, and Figure 1 shows PTS respondent characteristics in the United States. The 72 respondents to the MCS represent organizations with national (54%), regional (32%), and local coverage (14%). Managed care organization (MCO) membership varied from tens of thousands of lives to millions of lives, with a median of 500,000 lives. A total of 4 completed surveys were excluded, because the respondents came from the pharmaceutical industry. Of the 72 respondents, 22 were from HMOs, 12 from integrated healthcare systems (IHCSs), 26 from PBMs, 8 from preferred provider organizations, and 4 from Veterans Affairs orga­nizations. Of the 30 respondents to the PTS, 20 came from MCOs, 8 from PBMs, 1 from an IHCS, and 1 from an organization type not listed on the survey. In addition, 23 respondents indicated that they were P&T Committee members, 18 identified themselves in P&T support functions (it is possible to be a member of a P&T Committee and a supporter simultaneously), and 6 respondents had no direct role in a P&T Committee. The SMDM workshop discussion included 28 European experts involved in various aspects of healthcare decision-making with either an academic or health authority background. Participants were from Austria, France, Germany, Poland, Spain, Switzerland, and the United Kingdom. Respondents in the Asian, Middle Eastern and African, and Latin American surveys were all participants in workshops on future trends in healthcare, including pharmacists and experts with medical, public health, or health economic education who were working in healthcare or healthcare decision-making. Although 73.6% of the respondents in the MCS state that HEOR data are used regularly, only 5% indicate that the use of HEOR is included in the bylaws of their orga­nizations. The majority (approximately 82%) of the respondents expect an increased use of HEOR in the future (Figure 2). In the PTS, approximately 77% indicate that HEOR is considered a standard part of the P&T review process, and, at the same time, approximately 87% state that drugs with a lower cost are given priority when efficacy and safety are equal. However, quality assessment for HEOR data is limited. In addition, 68% of the MCS respondents indicate that there is no quality standard for HEOR being used by their organization (Table 3). Among those using quality assessments, this is done by using in-house checklists or by relying on the expertise of internal outcomes teams, external review teams, or the P&T Committee. When asked what changes would be needed in their organizations to make better use of HEOR data, 54% of the MCS respondents see a need for a more clear definition of HEOR data requirements, 47% see a need for increased HEOR competency in the decision-making committee, 42% suggest a need for improved in-house data analysis, and 36% see a need for increased prospective data collection. In addition, 39% indicate that there should be more frequent reevaluation of decisions based on HEOR evidence. 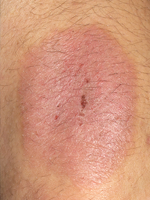 In the PTS, the safety and the efficacy of the drug are reported to be very or extremely important by all of the respondents to this survey (Figure 3). In addition, net ingredient cost and head-to-head comparisons are considered very or extremely important by 90% of participants, drug superiority by 87%, and outcomes data by 83%. Similarly, 100% of respondents also indicate they have good or very good performance in formulary decisions with regard to safety and efficacy. Performance using net ingredient cost is rated as good or very good by 90%, rebates by 67%, drug superiority by 67%, and outcomes data by 63%. Of note, although rebates have high performance (67%), they have low importance (43%), whereas head-to-head trial data have low performance (47%) and high importance (90%). In the PTS, with hypothetical medication placement scenarios—when safety, efficacy, and dosing were proposed to be similar—the medication with the lowest net ingredient cost was chosen most often: 77% for lipid-lowering and 83% for PPI drugs (Table 4). However, when actual published formularies were examined, only 7% had the lipid-lowering drug and 27% had the PPI with the lowest net ingredient cost available on a preferred tier. In the MCS, the highest priorities in the current decision-making process include direct medical costs, targeted treatment algorithms, and risk of off-label drug use. However, the anticipated future priorities demonstrate a shift toward patient-centered outcomes, in which patient quality of life, patient group opinions, and indirect medical costs are given higher priority. In an outcomes-based contract, the supplier is paid for the realization of a defined set of health outcomes, business results, or key performance indicators (eg, treatment response within 2 months after initiation of treatment, as measured by defined end points or symptom reduction by a defined percentage). Only 38% of organizations surveyed in the MCS currently use outcomes-based contracting, whereas 72% anticipate (ie, probable or certain) use in the future (Figure 4). The highest perceived value of outcomes-based contracting is reported to be higher flexibility for access to innovative technologies, reduced financial risk, re­duced clinical risk, the opportunity for a trial period, and giving more responsibility to the manufacturer for the outcomes. The barriers to implementing outcomes-based contracting include duration of time to outcomes, the definition of unquestionable end points, and the challenge of individual contracts within drug classes (Figure 5). Questions from the MCS were presented at a workshop at the European SMDM in 2011. The interest among the European participants in the results from the United States was very high and raised discussion as to what each question means in relation to decision-making in European countries, such as France, Germany, Poland, Austria, and the United Kingdom. In European countries, there is often a gap between national technology assessment and regional or local decision-making regarding drug formularies. The range of how countries in Europe are using HEOR data is broad, with the potential for considerable variations even within countries. Although some countries use clearly defined and explicit decision processes, including health economic analysis (eg, the United Kingdom, Netherlands, Poland), others may have less emphasis on health economic analysis and more emphasis on low price contracting after the primary decision has been made regarding the clinical benefit of a new therapy (eg, Germany). Because of the high diversity of the healthcare systems and the reimbursement decision process—and because of the level of payer decisions (ie, national, regional, local)—the MCS would have to be adapted to the healthcare environment in each of the European countries that are included in an extended study. The use of HEOR varied across all regions. 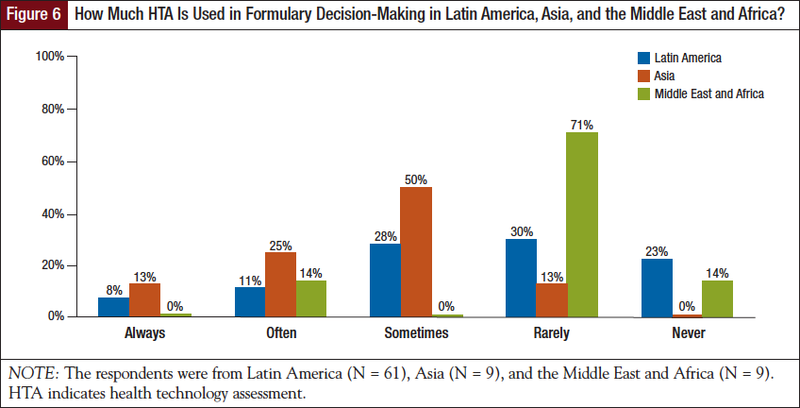 Only 9% of respondents in Latin America and 11% of respondents in Asia said that HEOR data are a mandatory part of the formulary or reimbursement decision-making. In addition, 24% of respondents in Latin America and 44% in Asia said that HEOR data are used, but are not mandatory. Furthermore, 15% of respondents in Latin America said that HEOR evidence was never used. In the Middle East and Africa, there is some awareness of HEOR but only marginal use of it in making formulary decisions: approximately 33% of respondents saw no use of HEOR in their environment. In addition, 40% of respondents noted that it is used, but it is definitely not mandatory to use such information. Assessment of health technology is a process used to examine the health and economic outcomes of implementing healthcare practices or treatments, including medications.9,10 HTA is used in Asia more than in Latin America or the Middle East and Africa (Figure 6). In Asia, 38% of respondents claimed that decisions are always or often based on HTA, but only 19% said the same in Latin America. Compared with only 13% in Asia who use HTA rarely, in Latin America 30% use it rarely and 23% said they do not use HTA methods at all. In the Middle East and Africa, 71% of respondents indicated that HTA is used rarely and 14% said it was never used. Outcomes-based contracting is not used by 53% of respondents in Asia and by 44% in Latin America; and 12% and 11%, respectively, said that outcomes research is used for contracting. 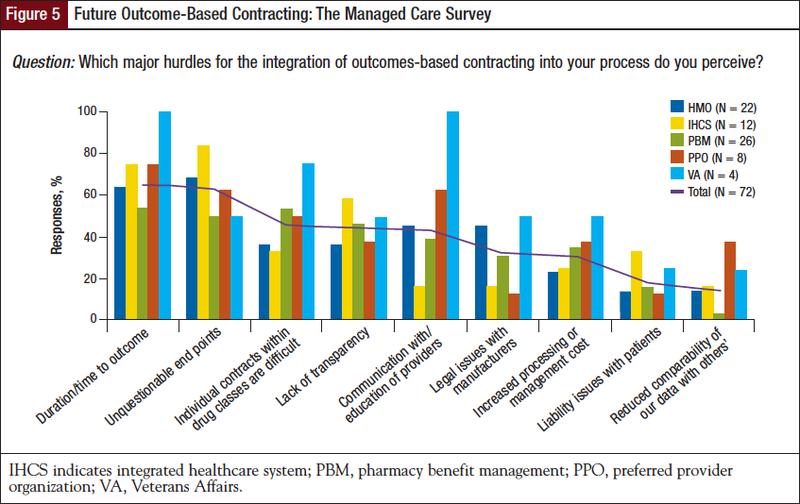 In the Middle East and Africa, outcomes-based contracting is done rarely today, but its use is expected to increase. Based on the results of the MCS and PTS, the majority of US healthcare decision makers use HEOR evidence when making formulary and coverage decisions, and the use of HEOR for these decisions is expected to increase in the future. However, the surveys also indicate that the majority of these decision makers do not have a quality assurance process in place for reviewing HEOR data. In addition, nearly half of the respondents indicated that clearer definitions of HEOR data requirements and increased competency of decision makers in interpreting HEOR data were needed to make better use of them. This may indicate a need for P&T Committees to include members with expertise in the evaluation and application of HEOR or to provide additional training programs for their current members. The hypothetical product placement scenarios from the PTS suggest that decision makers make decisions based on cost when other clinical factors are considered equal; however, actual product placements showed the lowest-priced branded products were not in a preferred position in the majority of formularies. This may indicate that the role of cost in the decision-making process is complicated and difficult to isolate from other factors, such as rebates. Decision makers view outcomes-based contracting as a way to provide better access to new technologies and to reduce clinical and financial risks; however, the current use of outcomes-based contracting appears to be limited. These survey results provide an important benchmark for the use of HEOR before the healthcare reform legislation of the Patient Protection and Affordable Care Act (ACA). In 2009, the American Recovery and Reinvest­ment Act (ARRA) allocated $1.1 billion for comparative effectiveness research and the ACA created the Patient-Centered Outcomes Research Institute (PCORI) to provide a steady stream of funding for outcomes research. The ARRA and the creation of PCORI indicate a shift toward greater support of HEOR research by the US government. This will certainly lead to an increase in the availability of HEOR data to healthcare payers and will help to provide them with data that better represent the populations they serve. Because the pharmaceutical industry currently provides most of the funding for HEOR, this shift in funding may also provide HEOR data for different populations and for disease states that were previously not examined. Observations at the SMDM meeting in Austria and at the subsequent Health Technology Assessment Inter­national conference in Dublin suggest that this project comes at a time when HTA organizations in many countries are beginning to address the question of how the work and research on HTA is used by decision makers. Because HEOR often is a major part of HTA, the analysis of the use of HEOR in decision-making seems to be timely and relevant. In terms of healthcare priorities, the discussions with a broad range of European participants (eg, Germany, France, Switzerland, Poland, Austria) indicated that cost containment is a key prior­ity. It was considered to have a higher impact on formulary or reimbursement decisions than patient centricity. Healthcare policy priorities reported by the respondents ranged from universal coverage and improving access to healthcare services (Latin America, Asia, Middle East and Africa) to improving quality (Middle East and Africa), better health outcomes (specifically Oman in the Middle East and Africa region), and cost containment (Asia and Egypt). Such priorities vary from country to country; for example, in the Middle East and Africa region, the healthcare priorities perceived in Oman differed completely from those seen in Egypt. Despite greater incorporation of HEOR and HTA in Asia, both Asian and Latin American respondents intend to use HEOR data to a comparable extent for contracting. From the payer perspective, outcomes-based contracts lower the clinical and economic risks but require commitment to system changes and a partnership approach, as well as alignment of objectives. For the supplier, there is a higher risk than with an activity- or drug-based payment scheme, but there is also a potentially greater reward and a similar requirement for the alignment of objectives. Implementation of outcomes-based contracts usually requires more complex management, performance mea­surement, and remuneration rules. Despite the attractiveness of only paying for the expected results, it is usually much easier for all parties involved to pay on an input-based (ie, time and materials contracts) or output-based (ie, fixed price per service or product) contract. Neither of the 2 surveys (MCS or PTS) was applied to a systematically selected audience, and many types of healthcare decision makers may not have been included in these surveys. Therefore, the respondents may only represent selected viewpoints, which may differ from the average decision maker in the United States. Furthermore, the global expansion of the survey was limited to a small number of decision makers participating at the workshops. The reporting of the results by region (ie, Asia, Latin America, and the Middle East) does not reveal the specifics of each country, and there may be considerable differences between the participating countries. The healthcare policy priorities reported by the respondents across all regions ranged from cost containment, via more patient-centric policies, to universal access. The difference in using HEOR for decision-making across various healthcare systems may be related to the priorities and can be expected to change over time. Once a country has achieved near-universal coverage, for example, the focus may then switch to another priority, such as improvement of health outcomes, cost containment, or toward maximizing overall value. The current data were quantitative in nature and should provide direction toward future qualitative surveys to obtain more detail and reason behind the variations among countries in the use of HEOR in decision-making. This study provides an important benchmark of how HEOR is used in the United States before healthcare reform, and future research should investigate how the use of HEOR changes afterward. Novartis contributed to the funding of the surveys. Dr Holtorf receives travel grants from Novartis. Dr Brixner received a grant from Novartis for the survey. Dr Keskinaslan is an employee of Novartis. Dr Oderda is a consultant to Novartis. Dr Dye is a consultant to Polyglot Systems, Inc, and is an employee of Humana. Dr Bellows has nothing to disclose. Garrison LP Jr, Neumann PJ, Radensky P, Walcoff SD. A flexible approach to evidentiary standards for comparative effectiveness research. Health Aff (Millwood). 2010;29:1812-1817. Chambers JD, Neumann PJ. US healthcare reform: implications for health economics and outcomes research. Expert Rev Pharmacoecon Outcomes Res. 2010;10:215-216.
van Nooten F, Holmstrom S, Green J, et al. Health economics and outcomes research within drug development: challenges and opportunities for reimbursement and market access within biopharma research. Drug Discov Today. 2012;17:615-622. Doherty J, Kamae I, Lee KK, et al. What is next for pharmacoeconomics and outcomes research in Asia? Value Health. 2004;7:118-132. Tantivess S, Teerawattananon Y, Mills A. Strengthening cost-effectiveness analysis in Thailand through the establishment of the health intervention and technology assessment program. Pharmacoeconomics. 2009;27:931-945. Holtorf AP, Watkins JB, Mullins CD, Brixner D. Incorporating observational data into the formulary decision-making process—summary of a roundtable discussion. J Manag Care Pharm. 2008;14:302-308. Brixner DI, Holtorf AP, Neumann PJ, et al. Standardizing quality assessment of observational studies for decision making in health care. J Manag Care Pharm. 2009; 15:275-283. Biskupiak J, Brixner DI, Holtorf AP. Current and future use of pharmacoeconomic and pharmacotherapy outcomes research data in decision making. Abstract presented at the 12th Biennial European Meeting of the Society for Medical Decision Making; May 30-June 2, 2010; Hall/Innsbruck, Austria. Abstract 22. Leung MY, Halpern MT, West ND. Pharmaceutical technology assessment: perspectives from payers. J Manag Care Pharm. 2012;18:256-264. Gallio D, Berto P. Health technology assessment (HTA): definition, role and use in the changing healthcare environment. Eur Ann Allergy Clin Immunol. 2007;39 Spec No:7-11. Rasooldeen R. Move under way to set up pharmacoeconomics center. April 29, 2012. www.arabnews.com/node/412095. Accessed November 13, 2012. PAYERS: Healthcare decision makers have used economic data to evaluate the cost-effectiveness of drugs for the past decade, at the very least. However, a formal process involving health economics, and not just drug cost, is emerging in the United States and around the world. This original research by Holtorf and colleagues shows that health economics and outcomes research (HEOR) will become a key factor in evaluating new chemical and biologic entities in the future. Pharmacy and Therapeutics (P&T) Committees have always placed the highest value on medication safety and effectiveness. Clearly, the job of all healthcare practitioners, whether on the frontlines seeing patients or in managed care organizations making coverage decisions, is to protect the health and welfare of their patients/members and provide medications that do what they claim to do. As Holtorf and colleagues demonstrate in this study, net cost is the next most important factor when considering a new medication for formulary coverage. 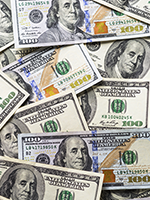 It is interesting—although not surprising to long-time managed care pharmacists—that rebates are lower on the importance scale for most decision makers, as this study shows. The results of this study reinforce the fact that P&T Committees would prefer lower wholesale acquisition cost pricing and better upfront drug pricing than higher rebates. With the advent of the Affordable Care Act and its spawn, the Patient-Centered Outcomes Research Insti­tute, more HEOR will be conducted and published by pharmaceutical manufacturers and by other researchers. This oncoming wave of new research will undoubtedly provide compelling outcomes data that manufacturers will use in an attempt to get every new drug added to the formulary. P&T Committees must therefore become more sophisticated in considering the quality of the HEOR data being presented, and use it appropriately in their evaluations of new drugs. Not all HEOR data are quality research. And more HEOR does not equal better HEOR. Healthcare stakeholders reported in this survey-based research that they do not have a formal process to assess the quality of HEOR evidence. This is a warning sign. Healthcare decision makers must increase the rigor of their evaluation of the HEOR evidence being used by their organizations to continue making the best decisions possible for their organizations and the population they serve. PATIENTS: Patients must also become more sophisticated in their review of medications. Over the past 10 years, patients have become key decision makers in their own healthcare. High-deductible health plans, health savings accounts, and the explosion of drug information available on the internet have made patients their own healthcare decision makers. All of the new HEOR data that will be available to patients with a few clicks of the mouse may lead to confusion and misinterpretation. Patients, too, must learn to critically evaluate to the best of their ability the data being presented to them, and then go to their trusted healthcare providers to help them interpret the evidence.